William Hogarth - The Social Media Portal. Life's events it seems are echoed down the centuries. Social problems and ills that befell a previous age can re-surface in the present - but just how similar are they? The word 'echoes' probably carries more significance here than usual, as it is always difficult to judge the magnitude of events in the past, relying on figures and distant voices to put it in to context. The narrative however is the same, uncontrollable intoxication, or the more sordid sounding 'Binge' drinking is no new phenomenon. Today the power of social media means that information can be passed at staggering speed, and images captured in 'real time' posted in under a second. Willingly or otherwise images of drunken excess are readily visible, and the rhetoric of many a tabloid newspaper who wishes to emphasis the current moral 'decay' and apparent social 'decline'. To step into the world of 18th Century London however is to explore a world of parallels, but with social ills on a far greater scale. Poverty, intertwined with escapism from despair and hopelessness found a new and willing partner in the form of a strong alcoholic spirit that was curiously seen as both patriotic and fashionable namely - Gin. With the accession of William and Mary to the throne in 1688 the favoured 'tipple' gin was given new precedence, This took the form of relaxing regulations on its distillation (as a gift to the people) allowing anyone to retail it without licence, making the product cheap and readily available. It was also seen as a way of halting imports on French Brandy ( a Catholic country) whilst supporting the Protestant realm. Sadly what was not taken into account was not just its stupefying effects, but worse its addictive qualities. 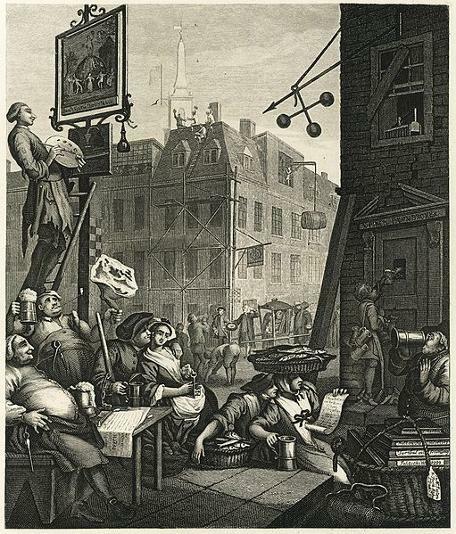 The most effective window into this malaise of 18th Century misery would be visual imagery, the Internet of its day, and the artist William Hogarth hit upon the idea of producing two contrasting prints to deliver his allegory - Gin Lane and Beer Street. 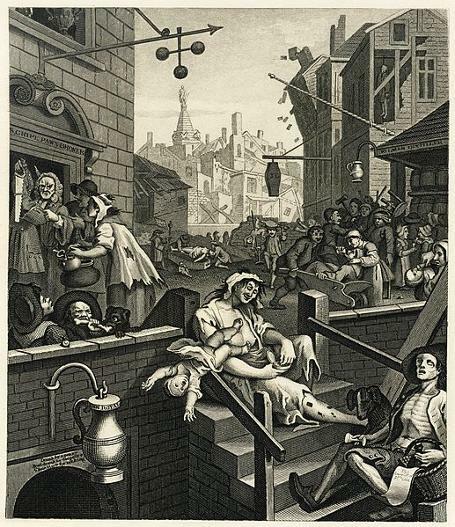 Hogarth himself was born of humble origins but had a strong moralistic and patriotic loyalty to his country and saw gin as being the 'foreign vice' and 'beer' the national drink of virtue. Gin offered oblivion, addiction and death, whilst ale offered stability and control. A product 'understood' by the nation that produces it. The fact that beers of varying strengths were produced ie: 'Table' or 'Small' beers for children, through to stronger ales for adult consumption showed its universal importance as water was impure and unsafe. The two works were said to have been encouraged by Hogarth's friend and writer the Magistrate Henry Fielding, who whilst having to deal with the crime epidemic gin was causing was pushing for reform with the Gin Act of 1751. 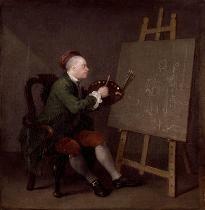 He enlisted Hogarth's help help to enforce the message visually to support his written condemnation. Another incident which is said to have shocked and forced Hogarth's hand was that of Judith Dufour who having already lost her child to the Workhouse at two years of age decided to reclaim it once more. The child had been dressed in new clothing supplied by the Union when she collected it. She then deliberately strangled the child leaving its body in a ditch so that she could sell the clothing (with a value of 1s 4d) to buy gin. The print was obviously designed to shock the viewer into reaction and whilst initially you are drawn to the women prostitute with syphilitic sores on her legs, who is clumsily fumbling with her snuff box whilst her child falls into the cellar below, there are many sub narratives that draw you in. The Pawnbroker on the left is the only business flourishing in the district as the Carpenter pawns what is left of his trade, and his wife their kitchen utensils, signifying their total addiction and eventual demise. The other characters play out the madness of the scene, such as the Barber who hangs himself in his own attic through lack of trade, to the lunatic who hits himself over the head with bellows whilst a baby is impaled on a spike. The Undertaker is busy at the cost of the misery around him as a mother runs screaming from her house at the loss of her child. Outside the distillery in the background on the right a crazed cripple raises his crutch ready to strike his blind friend. Both mothers and children are also being corrupted as the two young girls, Wards of St. Giles ( in which the scene is set ) wearing the cloth caps sup gin, and a mother feeds it to her baby on the right to quieten it. The pamphlet seller in the foreground ( said to be an ex soldier ) is close to starvation whilst the black dog is desperate meat. Is he ready to pounce when he expires and the opportunity arises? To the left of this a young boy and dog both close to starvation fight pathetically over the spoils of a bone. The overall message is one of chaos, despair, and hapless addiction, powerfully conveyed. By comparison Beer street was designed to work on a different level. Again you initially focus on the figures in the foreground but in the background events also unfold. There is an overall calmness about the piece and a sense of camaraderie, jollity and goodwill. In contrast to Gin Lane the pawnbroker here, to the right, is in trouble. So far behind is he with rent (due to lack of business) that he refuses to open his door and accepts a mug of beer through a hatch. His sign is in disrepair as is the building. There is good humour and contentment with the figures on the left, possibly a Butcher or Drayman enjoying their beer whilst taking a break, and the Cooper holds a tankard of ale and a leg of beef aloft - two statements designed to enforce his 'Englishness'. In the background on the right the sedan chair halts under the weight of the buxom lady within whilst its carriers take a well earned rest to imbibe. The workers repairing the roof on' the 'Sun' Inn'pub toast the Master Tailor, on what is the Kings birthday. The ladies to the right are cuddled as part of flirtatious and natural affection, no sense of entrapment or prostitution here. One is a lady fish seller who sings along with a companion 'The Ballad of Herring Fishery' whilst her overflowing basket a testament to the industries revival. What Hogarth wanted to enforce is that ale, in measured intake, goes hand in hand with productivity, and also at the end of a days toil, a reward. It had a beneficial role to play both in a physical and emotional sense. Once completed Hogarth sold prints of both Gin lane and Beer street from his studio in London for 1s a piece, and it has often been said that this would have simply put them out of reach of the very class he was trying to reach. Whilst this may be true the prints would no doubt have been seen by the working classes displayed either in shops or reproduced in newspapers, and they certainly would have been aware of them by word of mouth. More to the point is that the working classes had no political say over policy or reform during this time, and it was the middle or upper classes, those who could make real change who needed to be galvanized into taking action. The reward for his efforts was to see the Gin Act of 1751 finally take effect. Both works offer a remarkable insight into a time when visual imagery crossed every class divide to bring around true social reform. Something Hogarth must have been tremendously proud of, and the nation, eternally grateful.